Have you ever tried using a bamboo knitting needle? 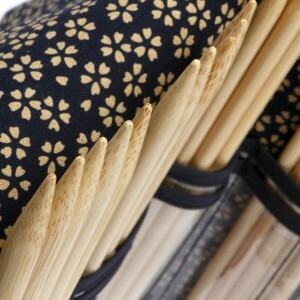 Bamboo knitting needles are an eternal best-seller with fans all over the world from past until present. The reason that they’re so popular is because they’re a product that make the best of the natural properties of bamboo. Bamboo fibers are strong and robust, yet have a good degree of flexibility. For knitting needles they are exceedingly light, durable, and supple. The bamboo gives the knitting needles a comfortable feeling and allows thread and string to glide off easily, two properties that cannot be emulated by other materials, and that allowing for enjoyable knitting. Japan sits at a 20-46° northern latitude with a wide range of climates, from the hot and humid south, to the temperate zones in the north. Furthermore, approximately 73% of Japanese land is mountainous with as much as 67% covered by forest, giving the land a rich, changeable climate and providing plenty of good-quality water sources. Some say that there are 600 species of bamboo in the world, while other’s say that there are as many as 1200, however in Japan there’s said to be between 150-600 types. Moso bamboo, Japanese timber bamboo, and henon bamboo are representative types found there. From those types, our company mainly uses hard and flexible moso and Japanese timber bamboo for our knitting needles from the Kyushu and San’in regions. The inside of bamboo is hollow, like a pipe, but the wooden part of this structure has a special trait. Bamboo is made up of conductive tissue which runs from the roots, up the stem, and right on through to the tips of the leaves, in other words it has a ‘fibrovascular’ structure which is surrounded by fibers called ‘the fibrovascular sheath’. The stiffness of the bamboo is directly in proportion to its fibrovascular bundles. Bamboo has an irregular structure where it has a hard outside with a lot of fibrovascular bundles but a softer interior. 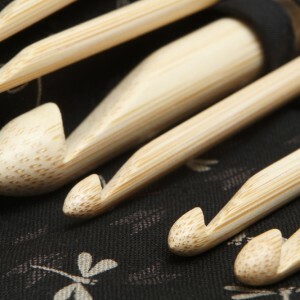 Japanese bamboo excels in fibrovascular bundle density, pliability, color, and shine, making it an ideal material for bamboo knitting needles. As well as this, bamboo has an extremely fast growth rate, making it a resource that regrows quickly. Using bamboo has little environmental impact and bamboo felling is connected with forest preservation. Another reason that bamboo knitting needles are so popular is that they are made of natural materials that are kind to the environment. Bamboo knitting needles have always been well loved by people regardless of nationality and generation.